I’m picky about pancakes. I heartily dislike most restaurant offerings, tasteless, plate-spanning platters of half-cooked batter that serve as nothing more than topping delivery devices. My Mom’s were the best, feather light with a slight crispness around the edges. She used Bisquick mix, made no additions, and didn’t do anything special that I could see other than let the batter sit for several minutes until big bubbles formed throughout. I could eat one sans topping, no syrup, powder sugar, or fruit necessary. I think that’s important. No filler foods. Everything you eat should contribute flavor to the meal. But enough foodie blather! I wanted pancakes NOW, but 1) had no Bisquick and 2) am trying to avoid white flour anyway. Then I vaguely recalled a recipe that used banana as the base, and dug it out of the bookmark library. It’s this recipe for Three-Ingredient Pancakes for One, and it’s basically “mash a banana, add 2 tablespoons of flour and an egg, then cook.” I used Bob’s Red Mill whole wheat pastry flour, added some cinnamon and most importantly imo, a healthy pinch of salt. Poured the batter into the pan, a scant quarter-cup or so per pancake. Let them cook away while I heated up a link of tomato-basil chicken sausage. 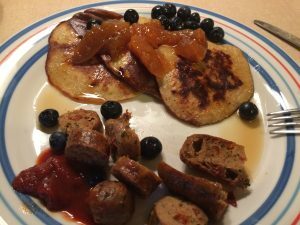 Served them with a little maple syrup, peach preserves, and blueberries because while a pancake by itself should be fine, I WANTED IT ALL. Final verdict–the recipe’s a keeper. Definite mild banana flavor, with the smoother consistency of an egg pancake. Next time, I would add a little vanilla, maybe some nutmeg.